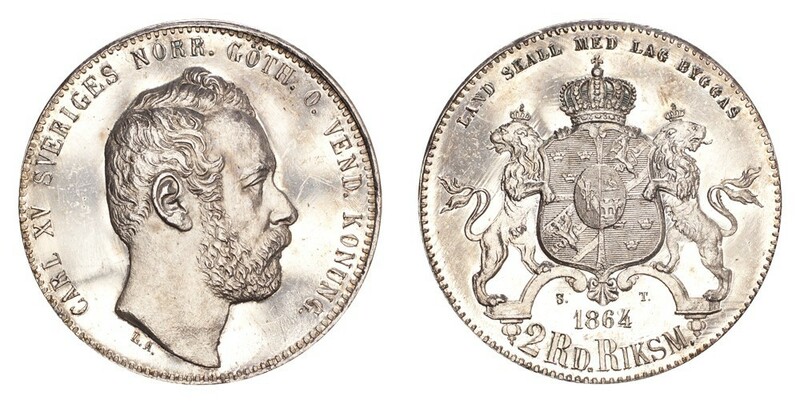 It is listed on Sixbid and NumisBids and held on Biddr.ch. Click here for directions to Coinex. Click here to view all auction lots. Click on image to open in auction website. Lot 43. 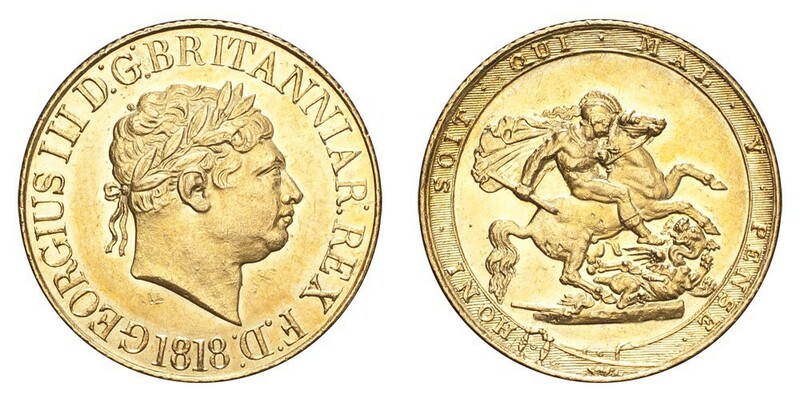 George III 1818 Gold Sovereign NGC MS61, starting at £2,000. Exactly 200 years since this coin was struck. Much scarcer than both 1820 and 1817, especially in mint state. Lot 51. William IV 1832 Gold Sovereign NGC MS63+, starting at £1,000. A very attractive, high grade sovereign from William IV. Lot 62. 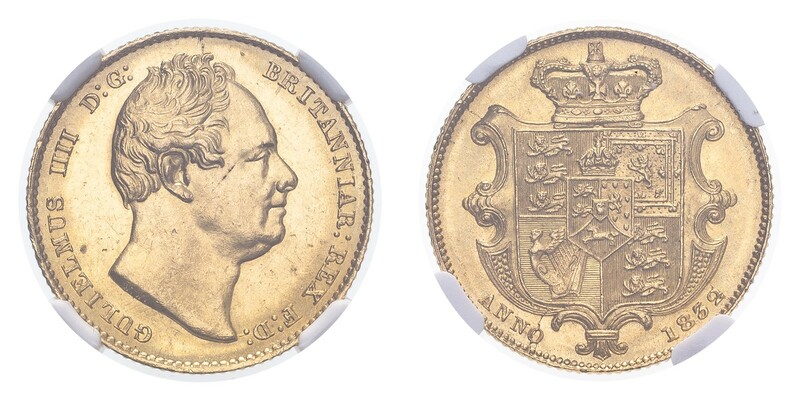 Victoria 1847 Gold Sovereign, uncirculated, starting at £500. Despite a slight rub on queen's neck, this truly astonishing specimen has everything the shield collector could hope for. 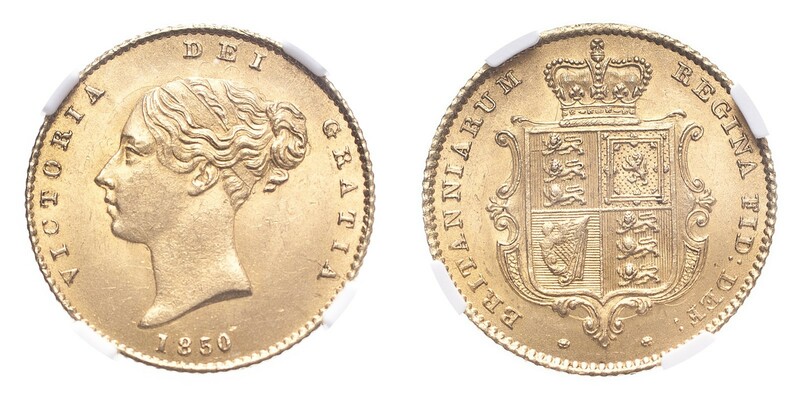 1840's sovereigns are hard to come by in high grades; this one is well-struck and has virtually no contact marks! Lot 67. 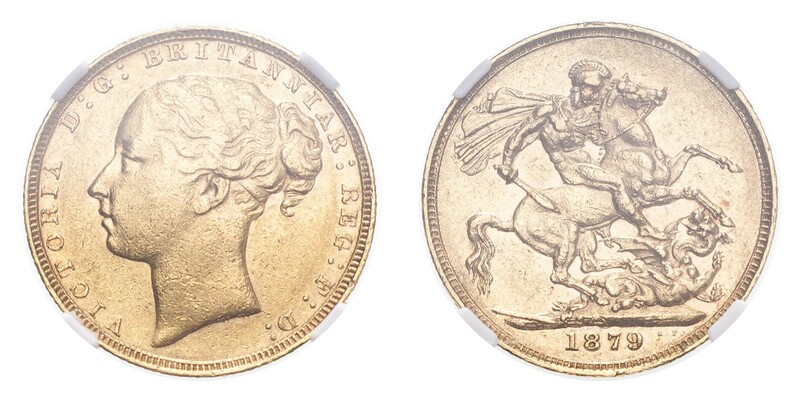 Victoria 1879 Gold Sovereign St. George London mint, NGC AU50, starting at £1,000. The London mint St. George sovereign is one of the key dates in the series. Another coin, also graded NGC AU50, sold in Heritage auctions in April 2018 for $6,000 hammer. Lot 89. 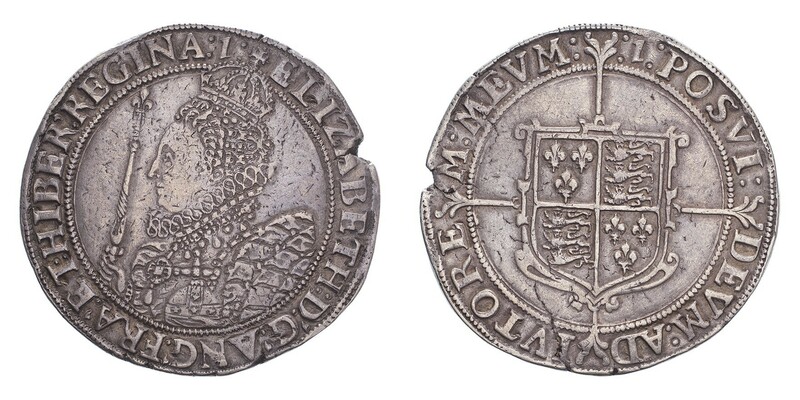 Elizabeth I Crown, very fine with a bold portrait, starting at £3,500. England's second ever silver crown, exhibiting an impressive portrait of the Queen. Planchet flaw at 2 o'clock, yet a well-struck and detailed example. Lot 90. 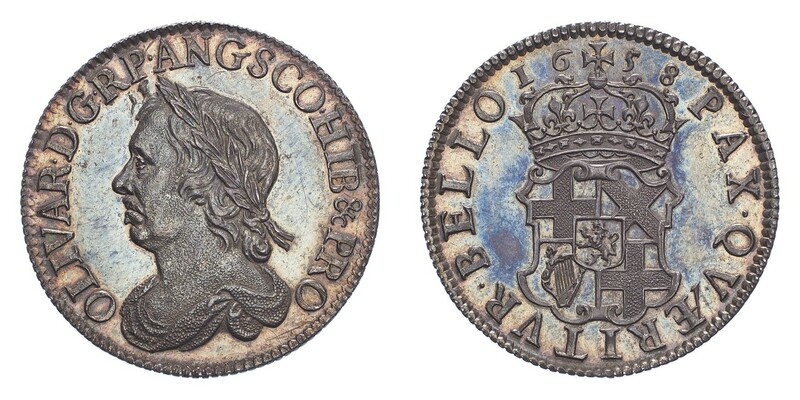 Oliver Cromwell 1658 Shilling, NGC MS63, starting at £4,000. Extraordinary toning and prooflike surfaces. 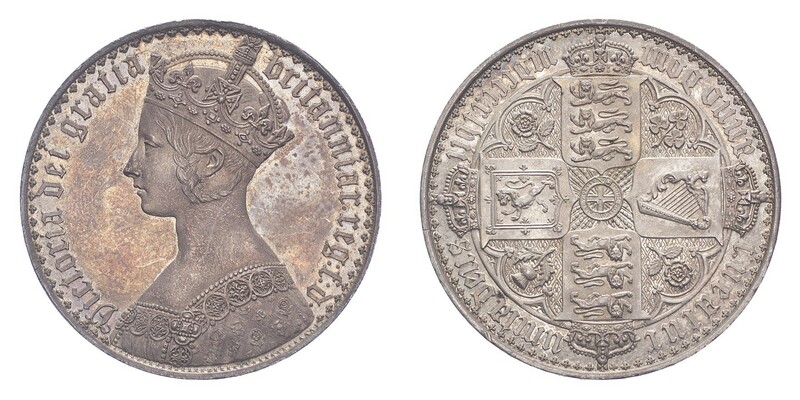 A faint hairline scratch in obverse field to right of Cromwell's head is mentioned for accuracy and do not detract from the tremendous eye-appeal. We made a video about this coin, which can be viewed on our YouTube channel, follow link here. Lot 113. Victoria 1850 Gold Half Sovereign, NGC MS63, starting at £1,600. One of the key dates in the Victorian half sovereign series. Very rare in this grade; value for 'UNC' unquoted in the Spink catalogue. Lot 121. 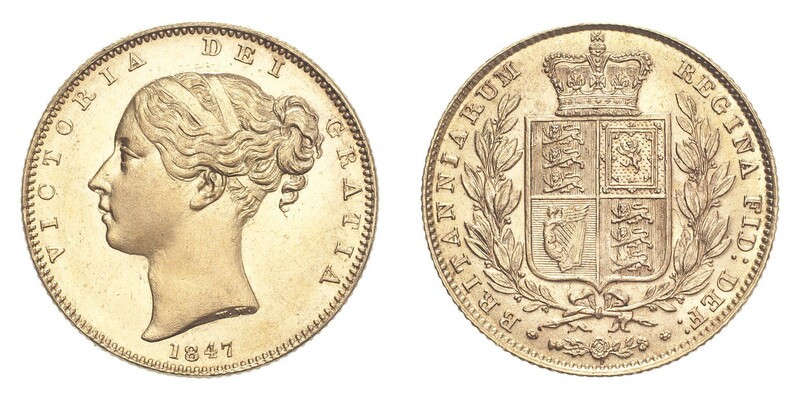 Victoria 1847 'Gothic' Crown, choice uncirculated, starting at £3,000. Lot 131. 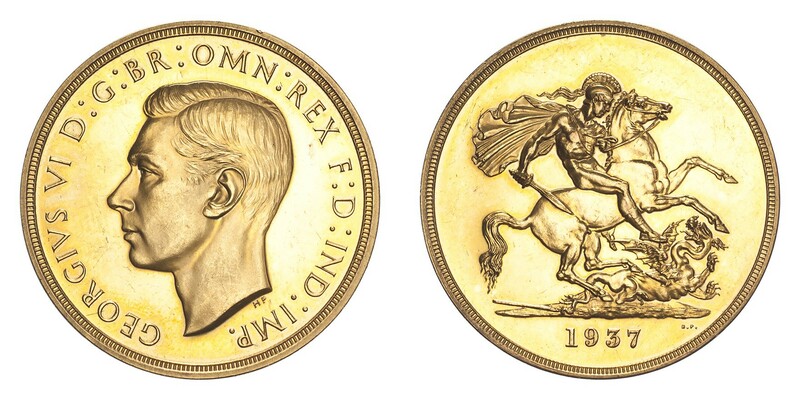 George VI 1937 Gold 5 Pounds, proof, minor hairlines and contact marks, starting at £4,000. The 1937 proof coins were only issued in 4 coin sets, of which 5501 were struck. This coin comes in the original red box as issued by the Royal Mint, adding interest to this popular piece. Lot 146. 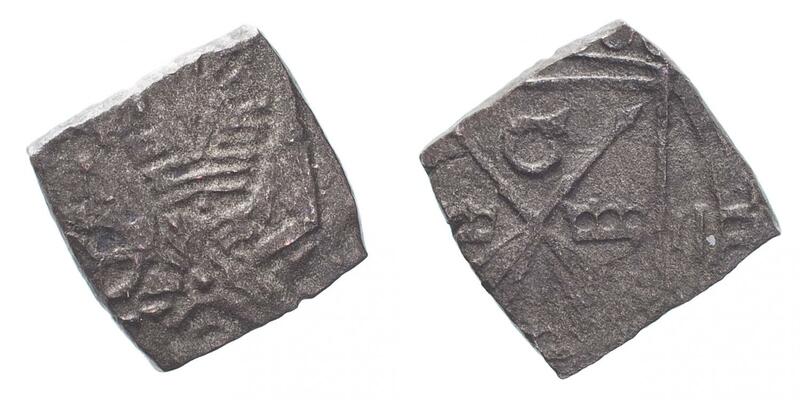 Sweden Gustav (I) Eriksson (Vasa), 'Liberation Klippe', no date (1521-22), bold very fine, starting at £15,000. Excessively rare and sought-after in all grades, these liberation klippes were struck in Hedemora or Soderkoping during the Liberation War against Denmark. Gustav, who was crowned Gustav I in 1523, won the war, ended Danish supremacy and started the 'Modern Period' in Swedish history. A detailed and well-struck specimen, one of the best in existence. Ex The Baronial Collection Bonde of Ericsberg (Nordlind auction, Part 5, November 2009) Ex Quensel (1918). Lot 149. 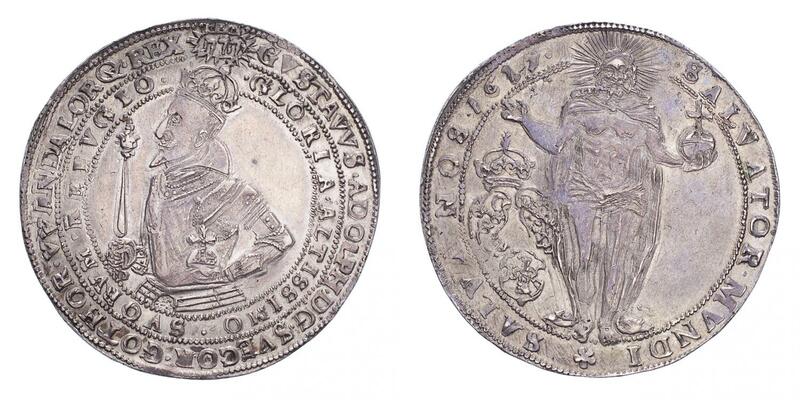 Sweden Gustav II Adolf (The Great) 1617 Riksdaler, extremely fine, starting at £5,000. One of the best riksdaler of all dates of Gustav II Adolf and consequently one of the best portraits available. Lot 160. 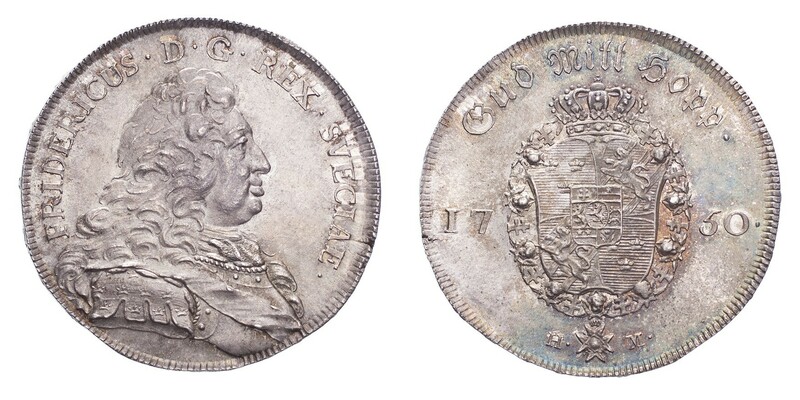 Sweden Fredrik I (Duke of Holstein Gottorp) 1750 Riksdaler, PCGS MS64+, starting at £2,000. Almost certainly the finest existing of this date and one of the finest of all dates. Lot 171. 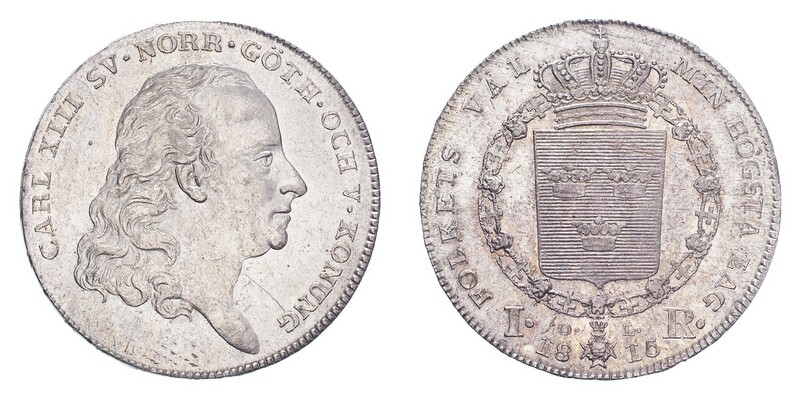 Sweden Karl XIII 1815 Riksdaler, uncirculated, starting at £1,500. Notable absence of adjustment marks, which is rare for this type. And much more. We look forward to receiving your bids.